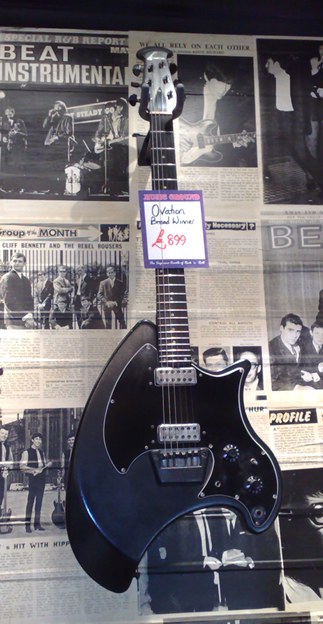 After my post about the Ovation Breadwinner guitar, I found a couple for sale in London last week. Here is a photo of one of them; it seems to be in pretty good condition and original, but I can’t vouch for that. The shop also had a pair of Hamer Phantoms, one white and one metallic red. Again, these both seemed to be in good condition and were alos both priced at Â£899. Music Ground definitely has the most obscure collection of guitars in Denmark Street, everything from old Guyatones, Burns and Ekos through to Arias and Hamers from the 80’s. I’d recommend a leisurely browse if you are ever in the vicinity!